Even Abby performed self-massage with the foam roller! I really felt a difference in my muscles this morning, they were less sore than they normally are after running. 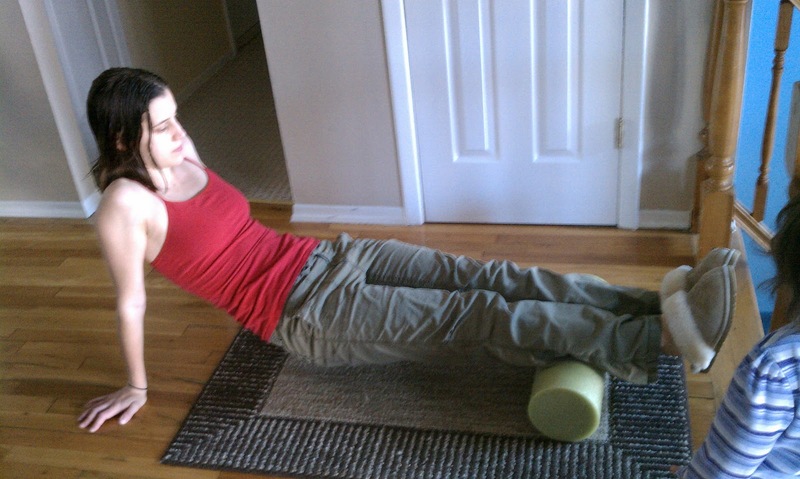 I plan to incorporate foam rolling into my routine 4-5 times a week. Do you use a foam roller and how often do you use it? Today’s training was power Vinyasa Yoga with Baron Baptiste. This particular yoga workout perfectly compliments my running routine. Some people feel yoga is a waste of time and that it is not a “real” workout but that is completely untrue. Yoga not only stretches but it also stenghthens every muscle in your body. It also helps to clear and focus your mind, reducing the stress that occurs from everyday living. Anyone looking for an active meditative workout should try power yoga. Do you practice yoga? What type of yoga is your favorite? Tomorrow is my LSD 8 mile training run. I was hoping to be able to run it outside but the weather is looking ominous for tomorrow with heavy rain in the forecast. I guess I will have to run it on the treadmill…blah. How do you get through long runs on the treadmill? Previous Post: « To Pre-Fuel or not to Pre-Fuel? your doing 8 miles while on LSD? should be interesting!